What do you do on Mull in winter? I’ve always been curious about the origin of our landscapes and the rocks themselves. Observing the magnificent, diverse topography on Mull can inspire a life-long interest in the subject of geology and severely enhance any outdoor adventure of the natural world. On a wet day on Mull in winter you don’t need to put on the DVD of Jurassic Park to travel back to the age of the dinosaurs. 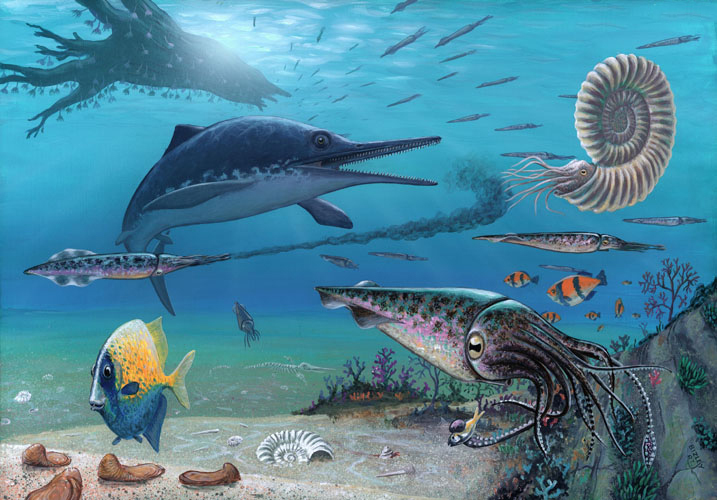 Small parts of our exposed sedimentary coastline date back 183 – 197 million years to the Jurassic period. When the tide ebbs to low water it reveals a time machine, transporting you back to the mesozoic era. Immerse yourself and explore ancient fossilised species. One memorable winter geo-excursion I had on the south coast of Mull was exploring the mudstone dominated Jurassic coast to see what fossils I could find. I tried to visualise what the planet would have been like during that time period. 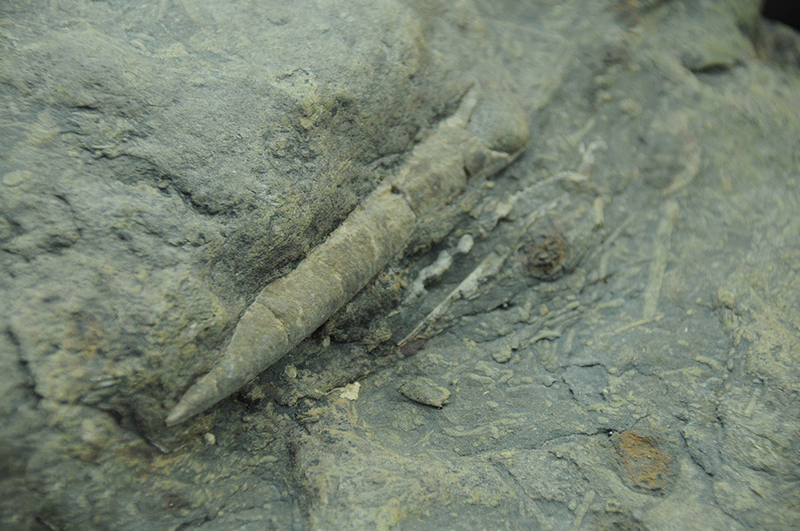 The key thing I wanted to see was large congregations of Belemnite fossils, which I noticed last time I was there. After discovering why they’re embedded in big concentrations, I wanted to see the fossils again with a fresh understanding. 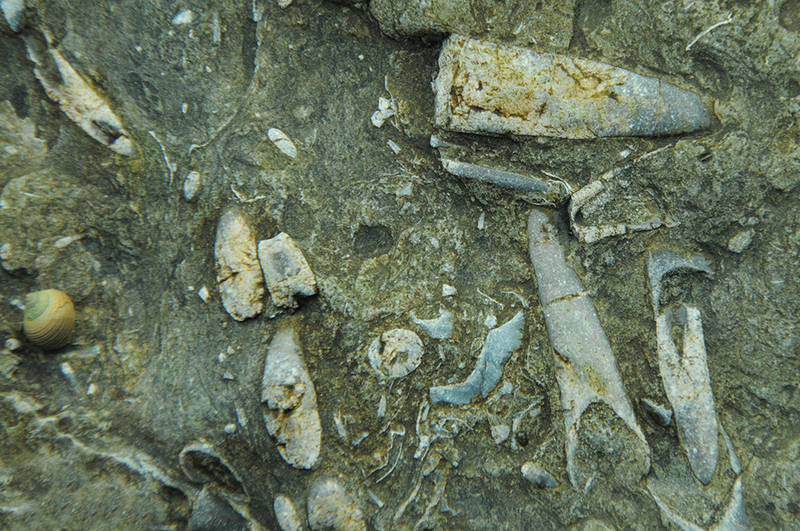 As you can see from the photo, these bullet shaped, ancient squid died in large numbers and in tight groups. Geologists think that this was not due to a catastrophic climatic event but a species orientated natural fatality after a sexual gathering had taken place, in the same way present day squid do. They shared the same fate as the dinosaurs, marine and flying reptiles, and ammonites at this time. There is no fossil evidence of these animals beyond the end of the Cretaceous period, 65 million years ago. One of the great things about enjoying rocks and minerals is that the weather conditions aren’t a problem. The rocks have been there for millions of years, and they’re not going anywhere in a hurry. So whatever the weather on Mull in winter, get out and explore the cornerstone of life on our wonderful planet! Due to the dynamic weather systems often experienced on the island, the photography opportunities are endless. There are angry seas, moody skies and constantly changing light patterns… A later sunrise and earlier sunset also makes the ‘golden hour’ more accessible. Just last month we had a fresh autumnal easterly wind blowing at force five, which provided a great opportunity to photograph the power of the ocean continuously crashing into Mull’s easterly coastline, which is usually more sheltered. I checked the tide table and planned out the areas that I would cover, enhancing photography opportunities. It was a cool breeze so I wrapped up warm and headed out with my camera gear, excited about capturing images out in the wilds! I arrived at my intended location in mid-afternoon so that the position of the sun was more suitable and the state of tide exposed some good photography subjects in the beautifully coloured seaweed. I watched the dramatic surge crash in to the shoreline a number of times in admiration. Then I planned out how I would compress that time into a single frame to capture the power of the motion. I found a location with Duart Castle showing distantly in the backdrop and a nice varied shoreline of rocky outcrops and seaweed. Using a dark filter to slow down the amount of light reaching my camera’s sensor, I was able to shoot frames consisting of a few seconds. Once I was happy with my composition I attempted to time the pressing of the shutter button in sync with a stronger wave crashing against the shore. After about half an hour persevering I managed to get a frame that I went home happy with! Winter time in the Hebrides brings a number of Atlantic storms, which is to be expected with islands located on the edge of one the world’s youngest oceans. These storms bring an increased chance of natural treasures being brought in with the seas. The best place to look is in the strand lines at low tide. 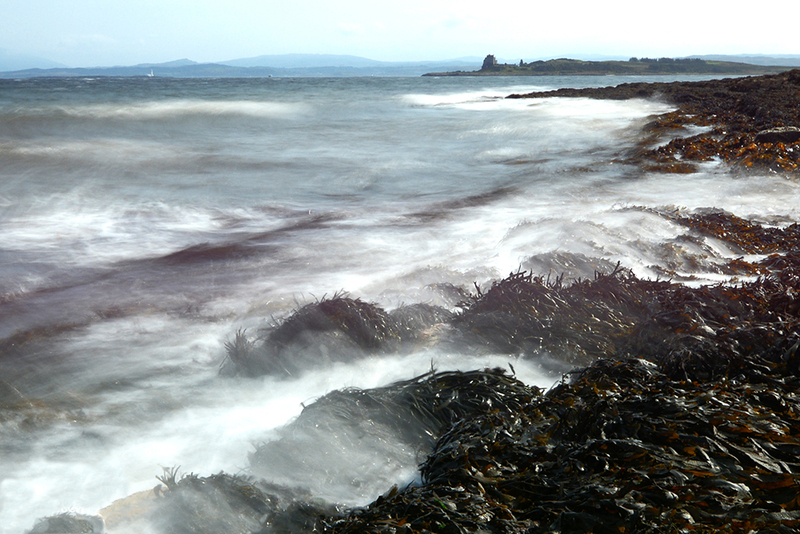 They are long lengths of seaweed stretched across the coast, potentially full of natural wonders! One winter walk with my family (who were staying in one of the Isle of Mull Cottages on the south coast of the island) produced an exciting find when I was looking for shark egg cases in the strand lines. 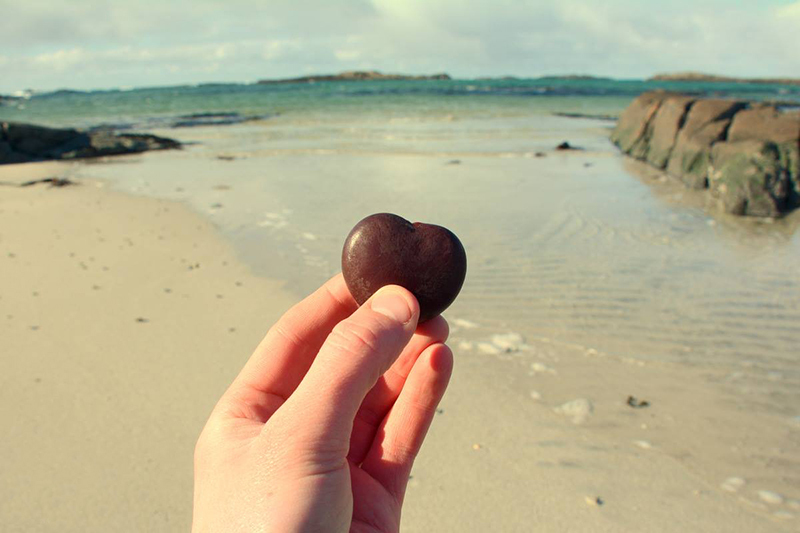 I ended up finding a ‘Sea Heart’ on the beach! I since discovered that they’re large, heart-shaped seeds that drop from their tropical vines in Costa Rica and ride the ocean currents of the world. Sea Heart vines are locally known as ‘monkey ladders’, because they actually provide arboreal thoroughfares for monkeys high in the rainforest canopy. See what you can find on Mull in winter. 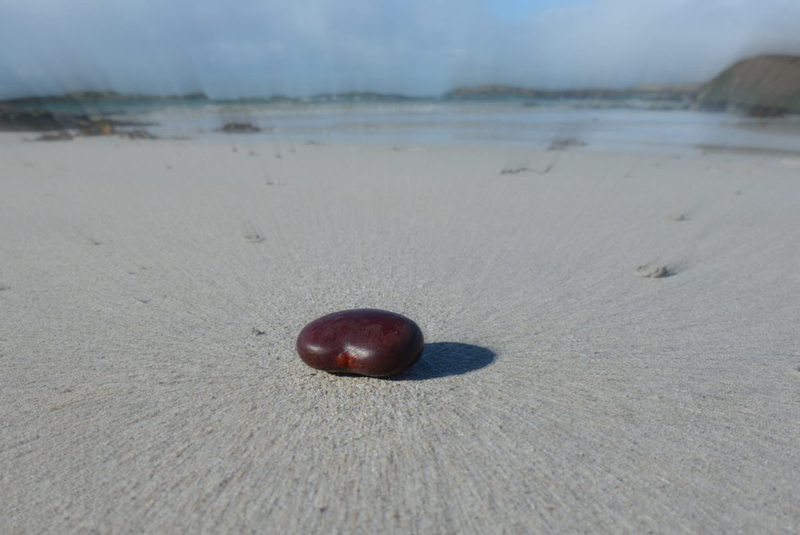 Whether it’s Mermaid’s Purses (egg cases), Sea Beans or absolutely any other tidal treasures, the wonderful unpredictability of nature makes it hugely exciting every time. I’ve had some unbelievable nights out under the dark skies of Mull over the years. Once I finish guiding on a wildlife tour during the day, I am always curious to see what else mother nature has to offer me, providing never ending beauty, wonder and learnings. Mull lies under some of the darkest skies in Europe, due to minimal light pollution. One of those many nights was in the late winter of 2014/15 when I was out in the field with a friend monitoring owls at dusk. The early evening was very productive as we heard Long-eared Owls vocalising as they prepared for the breeding season. 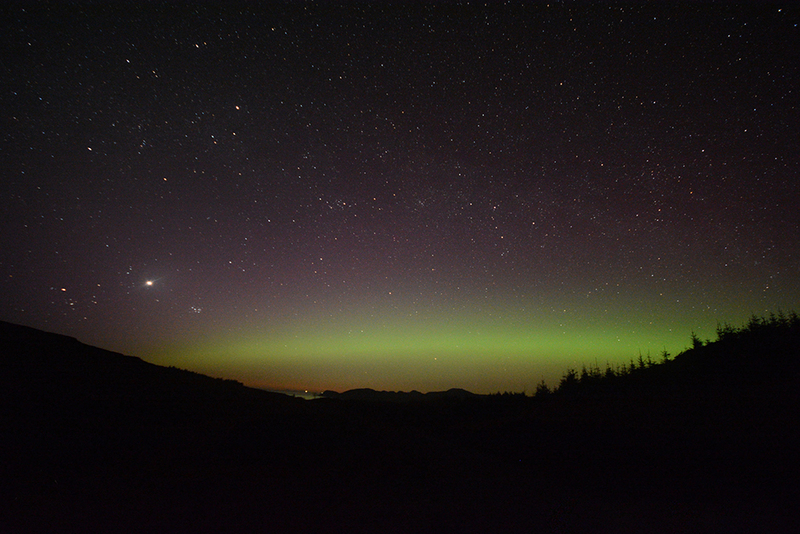 We looked to the north and noticed a pale green glow on the horizon, an auroral arc commonly known as the Northern Lights! Our perseverance out in the wilds paid off throughout the night as we were treated to dancing columns rippling throughout the northern sky at 40 degrees high! The spectacle of the Aurora Borealis was improved with the accompanying soundscapes of Barn Owls screeching and the odd shooting star overhead! Like geology and any natural history subject, if you know more about the origins of the topic, it greatly improves your all round experience. With the Aurora Borealis, when you’ve been waiting for many years to see it, it is worth considering how long a single display really has been in the making. We need to go to the centre of our solar system to understand where the Aurora was truly born. Fifteen million degrees celsius and crushing gravitational pressure – these are the conditions required in the core of our sun to generate the energy to seed the Aurora Borealis. It can take thousands of years for these electrically charged particles to reach the cooler outer parts of the sun. From there, they are released into outer space through moderate solar winds or a more explosive mass ejection. It can take 48 hours for these solar winds to reach our planet. When drawn towards our magnetic poles they can trigger the wonderful showing. 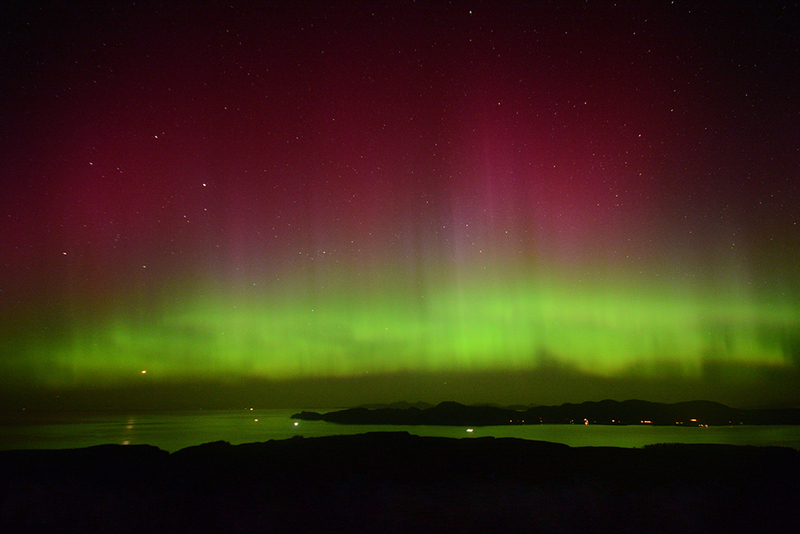 In this modern age we have more accurate space weather reports and also increased networking of local aurora sightings. With Mull’s higher latitude and unpolluted skies, if you put yourself in a position to be lucky, just maybe, you’ll get rewarded with a sighting of the greatest show on earth, thousands of years in the making! I hope these stories exemplify how exciting it can be out in wild areas on Mull in winter. There is so much to admire, explore and discover on the island of Mull in winter and we would be delighted to share it with you.